I think that I've commented before on the German mania for ice cream -- even in the midst of what you'd think would be very anti-ice-cream conditions, like cold temperatures, snow, sleet, and driving rain. Given this, last night I remarked to Shelby on how strange it was that our cafeteria at work didn't have an ice cream freezer. I wonder what took so long for the ice cream freezer to appear -- I'm sure that we were violating some obscure labor law by not having one in place already. Starting last week, I made a major life change: train fancier that I may be, I switched from the subway to the bus for my daily ride to and from work. I'd been having a run of bad luck, subway-wise. I always seemed to get there just as the train was pulling out of the station, so I had to wait around for the next one. The trip requires changing trains in the middle, and my first train was pretty much guaranteed to get there just after the second train had pulled out. At the end, there was the hike from my destination station to the office. What wasn't really a very long trip was taking me around thirty minutes each way. So, I decided to give the bus a try. There are stops just a short walk away from our apartment and my office; the trip between them is only supposed to take ten minutes. Unlike many American cities, where the bus can be home to some truly scary people, I'd be riding in relative luxury, surrounded by normal Hamburgers. My transit pass works for all buses (except the Schnellbusse -- "fast busses", which I didn't need to worry about) as well as the trains, so why not? So far it's been working -- but since the bus only runs every 15 minutes, I have to be more careful about when I show up at the bus stop (so, I make sure to take the dog downstairs a half-hour before I leave, not immediately beforehand). The exact speed of the trip depends on the psyche of each particular bus driver. This morning, we travelled with a maniac -- speeding up to pass a cyclist on a curve (on a two-lane stretch of road), and making a left-hand turn across a six-lane road from the rightmost lane. On Friday night, we kicked things off by going to the Hamburger DOM, a "fun fair" held three times a year. The DOM is like an American county fair, with all of the parts that aren't fun taken away -- leaving you with rides, midway games, and food of all types. We sat down for a meal of Bratwurst, Bier, and Pommes, and then started walking down the midway. We stopped at our favorite attraction, the Mouse Circus (basically, just a giant cage full of mice, with all kinds of ropes and ladders and wheels and mouse houses -- the kind of thing that a 10-year-old boy would build in his room if his parents gave him an unlimited amount of money and let him keep hundreds of mice). We rode a few rides, chasing each other with gas-powered go-karts around a oval, and riding The Largest Portable Ferris Wheel In The World. The Danish were there with a giant tent, hoping to convince us to visit Denmark; about two-thirds of the tent was filled with a big exhibit from Legoland (the original one) in Billund, Denmark. On Saturday morning, I got up early to get the grocery shopping out of the way. The novelty value of shopping for food has more or less faded, so I won't say much about that (but rest assured that if there are further discoveries in the area of "American-style" food, you'll hear about them here). After the groceries, I set out to find a model train store. Research on the Web led me to Z�ge und Mehr. German model train equipment is well-known for being highly detailed and finely engineered -- and in the US, expensive and difficult to get a hold of. At Z�ge und Mehr, these German things were just as expensive, but available in great abundance, so I walked around and drooled for a while. Thankfully for our bank account, I didn't come home with much, just a set of HO scale cats and dogs. Later, in the afternoon, we went to the Museum der Arbeit (Museum of Work) for DruckKunst 2004 -- an exhibition of original prints and lithographs from different artists and workshops, along with demonstrations of printing technology. After touring a large room full of artists with prints on display, we went to see demonstrations from the museum's workshops. Most interesting was the chance to see a working Linotype machine; the operator sat at the keyboard, typed a line, and once she threw the machinery into action, it cast that line into a type slug, using a crucible of molten lead for material. Afterwards, it automatically resorted the matricies (the brass forms used for molding the lead) for each letter into their individual bins. It was a frighteningly complex machine; I can see why so many people, including Mark Twain, went bankrupt trying to build mechanical typesetters. After the Linotype, we crossed into a different building to watch lithographs being made off of a stone; interesting to watch, but I was having a really hard time following the man giving the talk; he spoke German with what sounded like a thick Norwegian accent. On Sunday, the weather was gray and drizzly again, so we looked for an indoor tourist attraction. We settled on a visit to Miniatur Wunderland Hamburg; I think that Shelby was suitably impressed, although probably not enough to let me try to duplicate it in a basement or garage once we get back to the States. Seeing the model railroad towards the middle of the day on a weekend was a mistake, as it was packed with people. My previous visit was near closing time on a weekday, so there was plenty of space -- but now, at 9 Euro a head, it was easy to see how they could recoup their 4 million Euro investment. There were a lot of kids there; not only were the German children their usual atrociously-mannered selves, pushing and shoving and climbing over everything, but a lot of families were using Junior as a wedge -- you'd be standing at the railing watching the trains, and a kid would wiggle his way in front of you; then the rest of the family would elbow you out of the way, since they had to maintain connection with their precious one. It reinforced a rule I'd already learned -- anywhere where a lot of German schoolchildren are present, you've got to assert yourself and be prepared to use your elbows. We've already enjoyed a fine mac & cheese dinner, burned off our tongues with some of the candy, and watched most of one Simpsons DVD; this box will be enough to give us our American cultural fix for weeks to come. I love my family even if they don't send us boxes, but getting care packages from the States is nice, too! Thanks, Mom, Dad, and Zach! First, a sign that the German government (at least on the state level) is confronting new economic realities and making the tough choices that tough times demand: Lederhosen Subsidies Axed as Germany Tightens Belt. Second, if you donate clothes to charity, they may not even be unpacked before they're sold for export to a third-world country. (If you follow the link, notice how the boy in the topmost picture is wearing an American Boy Scout uniform.) This is why I'm glad that we donated our excess clothes to Sacred Heart Community Service before we left San Jose; having volunteered at Sacred Heart, we knew that our clothes would be given directly to people in the community who needed them, rather than, say, being sold in Zambia, where they'd help to crush the domestic clothing industry there under a flood of cheap second-hand clothes. This morning Scout and I walked down to our neighborhood vet for shots! Next month, we'll finally start taking trips -- a long weekend in Vienna, a week-long river cruise through the Netherlands -- long enough that Scout will need to stay at a kennel. So, I hunted down a suitable Hundehotel (a more difficult process than I expected; Hamburg may be a major city that's filled with dogs, but there are no kennels in the city limits) and made reservations for our small dog. They sent us back a reservation packet, which provided more information about the kennel and included a list of the vaccinations they expected Scout to have. The list was pretty standard, and Scout was covered, except for one mystery disease -- Leptospirose. What's that? From what we could make out, Leptospirosis, also known in the English-speaking world as "swamp fever", wasn't too common in San Jose, since our vet gave Scout the DHP-P multi-vaccination shot (Distemper, Hepatitis, Parvovirus, and Parainfluenza) rather than the DHLP-P shot. 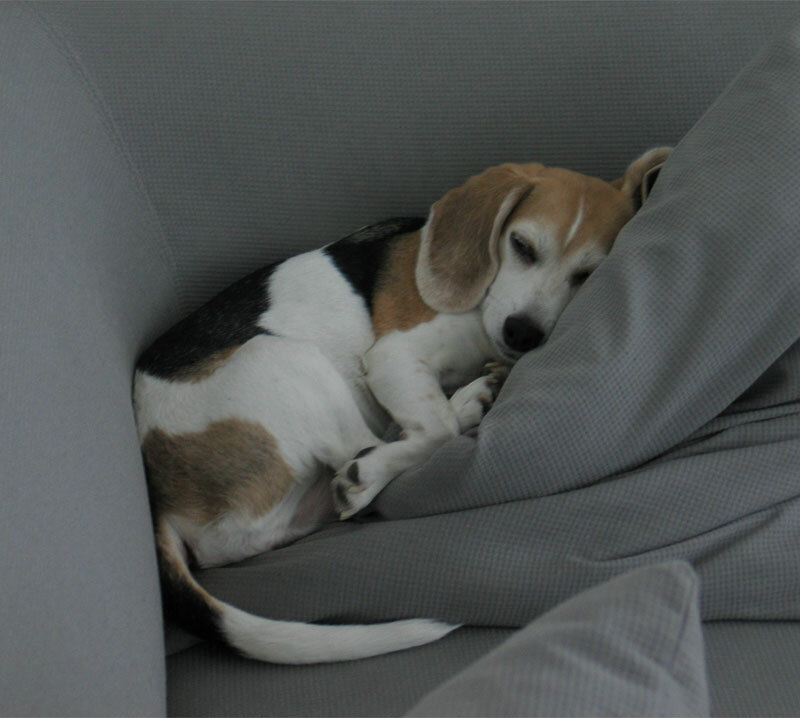 (Looking at this page, it also seems that the Leptospirosis component of the DHLP-P is the most likely to cause an allergic reaction in dogs, so it's often left out.) But now we needed it -- and we decided that it would probably be better to have a German-language shot record for Scout anyway (rather than having to attempt an on-the-fly translation/explanation of Scout's American immunization certificate each time it was necessary) -- so it was time for another trip to the vet. Poor dog! The local vet was very interesting. The vet offices I've been to in America always look like a small medical clinic -- large, white, and modern, full of up-to-date equipment and with lots of staff hurrying around. In contrast, Dr. Bielan's practice was like walking into All Creatures Great and Small. Everything was clean and well taken care of -- but at the same time, small, old, and a little worn around the edges. I opened the front door and there was no secretary waiting to take our names; instead, there was just a small waiting room, with an inner door labelled Behandlungsraum (treatment room) beyond. We were the only ones waiting; Dr. Bielan poked his head out of the inner door and said that he'd see us in a moment. Scout quickly caught on to the fact that this was a vet's office, and started up her usual routine of panicked panting and drooling. In a few minutes, the inner door opened wide, and we were ushered in to meet Dr. Bielan and his assistant. Everything was stuffed into this single inner room: a desk and a set of file cabinets for conducting business; lining one wall, shelves of medicine and an ancient refrigerator; in the middle of the room, a scale and metal examining table. In German, I explained our situation, and they caught on quickly. For them to provide us with a German Impfpass (immunization record), Scout would have to be reimmunized there -- but since all six immunizations the Hundehotel required came in a single shot, that wasn't much of a problem. As Dr. Bielan filled out our paperwork, his assistant fed Scout dog treats. Then up onto the table for the shot -- which she didn't even notice -- back down for some more dog treats, and we were done! Scout got her new international immunization record, which was a little booklet describing the immunizations she'd just received in English, German, and French; now our dog carries her own passport. As he was feeding her treat after treat (they were small, it was okay), the assistant asked me, "She's a Beagle -- that means she'll pretty much eat everything you give her, won't she?" Schoolkids: There is nothing cuter than seeing a whole class of German kindergarteners lined up waiting to get on the S-Bahn. I don't think that there's even such a thing as a school bus here, as far as urban children are concerned; the subway stations are always full of school classes of all ages, taking field trips to somewhere. At long last -- and 51 Euro later -- we're both legal! Shelby's passport now has a two-page set of giant stickers to match mine. Now we get to stay up to the length of our particular visa (July 31st), rather than the wimpy 90 days permitted by a tourist visa, and should we go through passport control on re-entering Germany (which doesn't happen often, now that more and more of Europe is part of the Schengen agreement), we essentially get treated like Germans -- just a wave-through, instead of getting the intense scrutiny more typically due shifty Americans. To bring this back to Hamburg, there's supposed to be an interesting English-only bookstore near the University; we'll have to go check it out sometime soon. Today's Achewood spoke to me on a very personal level. This past weekend was pretty lousy, weather-wise -- except for an extended shopping trip on Saturday, we mostly stayed at home and listened to the pounding rain and powerful wind beating against our roof for hours. On Sunday night, when the weather slackened, we braved a trip to the Hamburger DOM, a giant carnival that's held three times a year -- and, according to legend, has been going on in one form or another for the past 670 years, more or less. It might not have been raining, but it was still pretty cold, so we didn't stay for long. On the U-Bahn ride back, we rode in one of the newer cars, equipped with "Infoscreens" that rotate between news, short cartoons, ads, and station announcements. During the local news portion, our Infoscreen announced that the St. Pauli Fishmarket was flooded. Hey, that's where I work! The first time I came to live in Hamburg, in February 2000, there was a flood on my first day in the office. Once the floodwaters started picking up, one of my co-workers realized that he'd left his bike locked up in the bike area out front (which was in a depression to start with), and that it was now in belly-high-and-rising water. He ran outside, stripped down, and waded in to rescue his bike. Everyone was leaning out of the windows, watching his progress -- there was chanting as he made the attempt, and cheers as he successfully rolled the bike away. Nobody stayed late that day -- we all had to wade out. Hopefully I don't get a free day by virtue of flood today; it didn't rain much last night, and there's no new news in the online papers this morning, so I think we'll be okay. Still, I think I'll bring a camera (the old one) along to work, in case there are any dramatic-floodwaters scenes to be had . . .
Now that Easter is just around the corner, large displays of Easter candy are popping up. 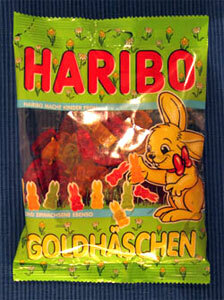 Haribo, our favorite manufacturer of gummi-candy products, sells Goldb�ren ("Gold Bears") all year long -- now, for Easter, we have Goldh�schen -- gold bunnies!
. . . a translation of Love That Dog, by Sharon Creech. It's highly recommended in our household (even though it gets sad at the end); it's about a boy who, with some guidance from his teacher, discovers a love for poetry while trying to tell the story of his dog, Sky. Appropriately for a book about poetry, it's written entirely in free verse. 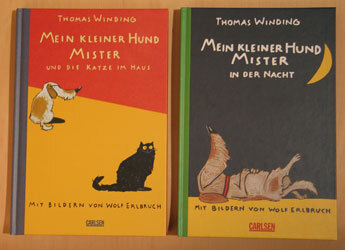 It must have been a bear to translate, but (as far as I can tell) the translator did a good job -- to me, it "feels" the same way in German that it does in English. 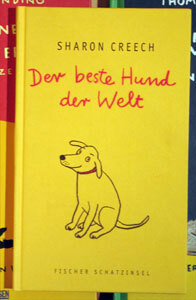 My happiness at finding Der beste Hund der Welt was tempered somewhat when, on my way out, I saw the book that was prominently displayed at the entrance to the store: Schwarzbuch USA (Black Book USA), by Eric Frey. I tend to let most examples of anti-Americanism in German bookstores go in one ear and out the other -- for example, yes, there are prominent piles of Michael Moore books in almost every German bookstore I've seen, but he's a homegrown loudmouth, and it's America's own darn fault for making him popular enough to export to foreign countries. This one, however, stopped me in my tracks. Basically, it's a five-hundred-page compendium of everything that America's ever done wrong ("Das komplette S�ndenregister der USA" -- "the complete register of America's sins") from 1776 to the present day. One might think that an author coming from a culture that could compile a pretty hefty Schwarzbuch of its own might hesitate before damning the USA so completely, but it turns out that's America's fault, too! You see, it was the manipulations of American capitalists during the 1920s that caused the depression, which provided fertile soil for Nazism! And if the Allies had made the decision to bomb the gas chambers at Auschwitz, the Holocaust would have been over so much earlier . . .
Shelby already wrote about Thursday's visit to the orthopedist, so I won't recap the whole thing here. I will say, though, that I'm impressed with the speed and decisiveness of the German doctors that we've met so far. Dr. Kaden looked at Shelby's foot briefly, told us three things that her problem might be, and then in rapid succession had her foot X-rayed, eliminated one of the possible causes (a heel spur), and then wrote a prescripton for Vioxx and her fitted for custom orthotics. The whole thing took an hour; if it hadn't been a busy day at the clinic, I think it would have taken less. Maybe this whole snap-judgement, rapid-action behavior comes from not having to worry about multi-million-dollar malpractice suits or being second-guessed by HMO bureaucrats. I suspect that part of it comes from differing national attitudes towards people in authority (and deference to people with titles -- in Germany, if you can claim Doktor as part of your name, even if it's an academic title, there's no way you're not going to use it on a daily basis). Frankly, if I'm coming down with brain cancer or a Tropical Fever So Mysterious It Doesn't Have a Western Name, then I want to be involved in an ongoing dialogue with my medical professionals and have a strong voice in my medical care -- but for routine stuff, I'm fine with being dictated to by an all-knowing doctor, particularly if it gets us out the door faster. We've already spent too much time in hospitals and doctor's offices! I was talking with my mom earlier this week, and found out that by not providing a continuation of our us-versus-the-ex-landlord story (previous episodes here, here, and here, in chronological order), I'd left her with the impression that he was still holding on to our entire $3,798 security deposit. Since I'm sure she's not the only one, I present another installment of: So What Did Happen Between You Guys and Your Former Landlord? In our last installment (on February 13th), I reported that I'd had a conversation with our landlord, "Joe", (on the 6th), in which we established that our deposit was actually $3798 (not $1899), and agreed that any share of carpet-replacement costs paid by us would be pro-rated on the age and expected remaining life of the carpet. He asked me to e-mail him a summary of our discussion, which I did immediately afterwards. Now it was one week later, and I'd heard absolutely nothing from him. If the deposit was two months? He's taken a week to respond, and still hasn't bothered to check the contract? I send him a reply, including my address and bank account info (which I'd already left with him once before), as soon as I get his note. Kevin, I don't find your act info. Could you resend? It's now Tuesday morning, California time -- past the time when my bank reconciles its accounts for the coming day -- and I still don't see a $2328 deposit refund from you. Have you made the transfer to my account yet? If not, when were you planning on making it? At this point, I feel compelled to point out that by California law, you had 21 calendar days after we moved out to refund our deposit, as well as furnishing -- by mail -- a detailed list of any deductions you've made. (See California Civil Code, Section 1950.5 (g)(1).) The 21-day deadline expired last Thursday, so you're now five days overdue. I am very sorry kevin. I will do it today. I apologize. transfer in the day and will show in your account in 2 business days. While I'm pleased that he's finally taking action, I'm a little upset by his last mail -- if I had elected to pay my monthly rent out of a Charles Schwab brokerage account, would he have been okay with my deducting $25 in wire-transfer fees each month? But later that day, before I sit down to type out an indignant e-mail, I check my bank account -- not only is his transfer there, but it's for the full amount; he made a mistake and ended up bearing the $25 cost of the wire transfer himself. Ha! You promised me on February 26th that you would send me an itemized statement of your deductions from our security deposit, along with receipts/invoices documenting those deductions. As of today -- almost three weeks later -- I have not received any of those items. By law [California Civil Code Section 1950.5(g)], you were supposed to send the itemized statement and receipts to me via first-class mail 21 days after I moved out; that deadline passed on February 19th, 26 days ago. For any repairs not completed by February 19th, you had 14 calendar days after those repairs were completed to send receipts to me. Given that you advertised the house on craigslist.org as being available by the end of February (and that you've removed your listing), I have to assume that the deadline for you to send me those receipts has passed as well. Again, the *only* receipts that I don't want to see are for the $80 paid to Alberto and the $120 paid to Alma, since these were previously-agreed-upon deductions, and I know their rates. I want to see receipts or documentation for all other work. 2) For any work that cost less than your original good-faith estimate, or for any work which you are unable to provide a receipt or documentation, that you provide me with a refund. If a refund is due, you can mail a check along with the receipts to the address above. 3) The law spells out very specifically the level of detail that your itemized statement and the receipts must contain; please make sure that any documentation that you provide to me meets the requirements of the law. (The original E-mail summary that you sent to me was extremely vague.) I've excerpted the relevant section of California's security deposit law at the end of this mail, along with references, should you want to look up the text of the law yourself. I remain hopeful that this can be settled amicably and without further delay. I look forward to your fulfilling your legal responsibilities as a landlord by sending me complete documentation, along with any appropriate refund, as soon as possible. The California Department of Consumer Affairs has a document summarizing changes to security deposit law for 2004: see http://www.dca.ca.gov/legal/landlordbook/2004_companion.pdf . A summary of the law can be found on page 7; the text of the law itself can be found on page 9.
. . . and once again, several days have passed, and there's been no response yet. Which makes me even more suspicious -- if Joe had used our security deposit money to do the work as claimed, wouldn't it be a simple matter to produce the receipts? Maybe I'm wrong; maybe Shelby's parents will get a packet of complete, legally compliant documentation in their mailbox this week. But should he continue to stonewall us, I'm pretty sure that we'll end up going to small claims court once we return to the US. (Since people have arrived at previous installments of our saga by searching for things like "landlord" and "security deposit" at Google, I should say: I'm not a lawyer. I have no idea if the last letter I sent to Joe was "good" or not; feel free to use it as a model if you want, but I'm sure that you can get better advice someplace else. "D" for doctor, that is. Today I came to work early, so that I can leave at 3 PM to go home and accompany Shelby to her doctor's appointment. I don't expect that the orthopedist will provide us with a miracle insta-cure, but hopefully he'll provide her with the first steps (ha ha) to being able to walk comfortably again. When all of Europe is spread out before you, you don't want to stay back in the apartment or hotel room because it hurts to walk! I have to admit to a bit of schadenfreude last night. I was sitting in an S-Bahn train that was stopped in a station with its doors open; a Cool Skater Dude was skating down the platform at high speed (which has to be all kinds of illegal) towards the train. Obviously, he was setting himself up for a spectacular flying dismount through the open door and into the train. Unfortunately, he miscalculated a bit, and hit the side of the train, right next to the open door, with a solid THWACK! He quickly rescued his skateboard, which was about to roll down into the gap between the train and the platform, and sheepishly walked onto the train, where everybody was snickering at him. Well, if you visit Shelby's blog, you can read her story about how we had to make a surprise trip to the emergency room on Sunday morning. The good news is that it's nothing serious -- a mysterious intestinal infection -- and she seems to be well on her way to full recovery. Knowing as little as I do about the German medical system and still feeling insecure about my language skills, I was very afraid to dial 112 (the German 911), but everything went very smoothly. Dealing with the paramedics and hospital staff in German went fine, and once we were at the hospital, the only time I truly felt nervous was when they took Shelby away and dumped me in a waiting room -- I envisioned the hospital staff asking her all kinds of complex questions in German, leaving her to fend for herself while not coming to get me for hours. But as you can read in Shelby's entry, everyone at the hospital spoke very good English, and as we seemed to be the only people in the ER, we were dealt with promptly. Inside Shelby's room in the ER was a gigantic unlocked cabinet, door halfway open and filled with drugs of all kinds; you definitely won't see that happening in an American emergency room. Most stories I read about Americans who have to make an emergency trip to the hospital here end with somebody on the hospital staff saying something like "Ha! You crazy Amerikaners mit your private insurances! It iz zo difficult to work out ze billink, zat ve vill just give you this hospital visit for free!" Unfortunately, I don't think that's going to happen to us (for one, we're locals) ... we'll just have to wait and see. On Saturday, we decided to take full advantage of Germany's dog friendliness; we took Scout along with us on the train to go shopping in the department stores downtown. Cute dog-in-subway and dog-in-department-store pictures here. Only once did I think that we were about to get in trouble for bringing Scout into a forbidden part of a store -- an employee came towards us, focused on Scout; I couldn't quite catch what she was saying, but I heard the word nicht (not -- as in "not allowed" or "not here" ...) and thought that we were busted. Nope; the nicht was for the people she'd been talking to before we came into the room. She was just coming closer so that she could pet the cute dog! Continuing the series of blog entries based on things we see on TV, earlier this week we saw a newsmagazine program (Akte 04 on Sat.1) that features a weekly segment about the life of the Brodowskis, a family recently emigrated from Germany to the USA. Milk comes in containers that you have to keep refrigerated! Service at stores is fast and friendly -- and employees make eye contact! I salute the woman who contributed this: Every Sunday when I go shopping, and the stores aren't overcrowded, and there are no long lines at the checkstands, I think: thank God I'm in America! I Am Ruler of All I Survey! Today I faced down what I fear most and made Shelby a doctor's appointment. Actually, I faced down two of the things I fear most: the German medical system, and my lingering German-language phobia, even as I'm able to conduct even-more-complex transactions . . . like making doctors' appointments. One of the neat things about working in an office right on the harbor (and I mean right on the harbor -- you could swan-dive out the nearest window into the water) is that you get to watch all of the harbor traffic. You get used to seeing particular types of boats every day -- commuter ferries, tourist ships of various sizes making round-trip tours of the harbor, police and fire boats, big container ships being pulled by tugboats in and out of Hamburg's container port. Once or twice a week, there's a giant floating crane that makes its way from one end of the harbor to the other. Occasionally, though, something truly unique and noteworthy floats past our office. Yesterday was a downer, for various reasons -- so watching the British aircraft carrier HMS Ark Royal steam by just before lunch brought a needed dose of little-boy let's-all-run-to-the-balcony gee-whiz into the day. She was being escorted by a fire boat, shooting celebratory jets of water into the air; a school of smaller boats packed with sightseers followed alongside, keeping a respectful distance. Helicopters circled overhead. After the Ark Royal passed by, everyone's next thought was "wasn't it awfully small for an aircraft carrier?" "We see container ships bigger than that every day!" And compared to the average American aircraft carrier, it certainly is: almost four hundred feet shorter, weighing a quarter of the tonnage and with about a third of the crew. I guess that being part of the all-powerful British empire just isn't what it used to be. If you look at the pictures on the Ark Royal's Website, you can see the noticeable upward-curving "ski jump" at one end of the flight deck: no wonder the British developed the vertical-take-off Harrier jet. Later that day, a truly gigantic container ship -- fully-loaded and about as tall as our office building -- passed by outside our windows. On a deck that was a couple of stories above our heads, I could see a mini-parking-lot of cars (presumably for the use of the crew while the ship was in port) lining one side of the ship. In its own way, it was just as much of an engineering achievement as the Ark Royal -- but it didn't pack any lethal power, so I think that I was the only person who even looked up from his desk. When things are dark and cold, and you feel as if you're being dragged along by uncaring forces out of your control, it's important to take some "you time" -- dig in and relax! Stop to thorougly sniff that homeless man who's digging through the garbage dumpster behind your building! As promised, here are some pictures from our snow day this past Sunday. My German is good enough to follow virtually everything that happens in these meetings (and thankfully, technical German and technical English share a lot of similar-sounding words), but it takes a tiring amount of concentration for me to do so. And even though I may be 'getting it', it doesn't take much to slip up in the eyes of my colleagues -- ask for something to be repeated before answering a question, and I risk getting a complete re-recitation in English (no, I was understanding you, I just didn't hear your last sentence); don't ask enough questions or make enough comments, and I'm obviously not understanding (no, I understand what you're talking about, but pipelining is outside my area of expertise, so I don't have any meaningful comments to make). The weekend was much more restful. On Saturday, we didn't do much more than shop for groceries (making a thrilling discovery; see below) and a few dearly-needed necessities for me: a new pair of shoes (my old ones were getting, um, air-conditioned) and a transit pass (a no-brainer: the pass costs 49 Euro a month, while it would cost me at least 80 Euro in single-ride tickets just to go to and from work each month). While we were shopping, it started to snow and continued snowing late into Saturday night. We woke up on Sunday to a winter wonderland: Scout and I went out and walked around in the snow for a couple of hours. 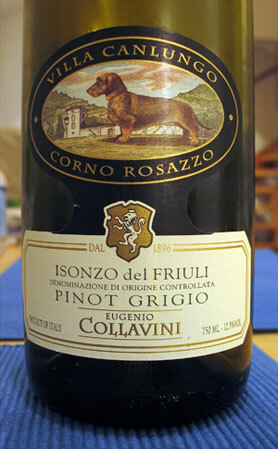 Who could pass up a bottle of wine with such a fine-looking label? 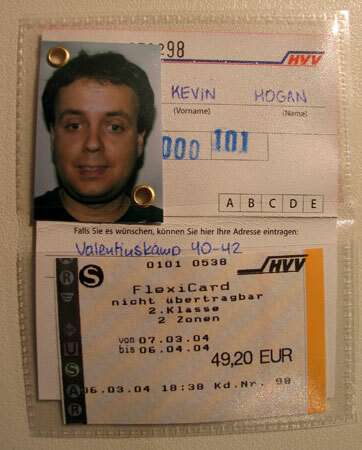 My transit pass; Nobody expects ID photos to look great, but this is quite possibly the worst photo of me ever taken. Earlier this week, Shelby and I were flipping through the TV channels when we came across a program where an older woman was being sternly lectured by two uniformed men for not picking up after her dog! Was this some kind of fictional dramatization -- except for us, it seems that nobody here picks up after their dog. Did German police really have this much free time on their hands? Our interest piqued, we stopped channel-surfing and settled in to watch . . . the Adventures of the Offenbacher Ordungsamt! The camera then followed the men back to their car; from its markings, we found out that they weren't regular police (Polizei), but were instead officers of the city of Offenbach Ordnungsamt -- in a sloppy literal translation, the office of keeping order. I'd never heard of the Ordnungsamt before, but it quickly became clear these men were in charge of policing minor-league "broken window" public health and safety complaints, so that the "real" police could worry about robbery and murder and the like. For the next hour or so, we rode along with the two officers for one gripping action scene after another: they busted a man for operating an informal, unlicensed sidewalk garage (and more unforgiveably, for leaking oil on the sidewalk! ); they stopped by an apartment to investigate a report of a junior-high-age kid missing school (foolishly, he told them he "didn't have to go to school anymore"; one radio call in to the school office, and so much for that lie); they 'convinced' a couple of homeless men in a public park to move along; in the most involved call of the program, they investigated reports of a slum apartment building (it was; when asked about rats, one of the residents held up his hands about three feet apart -- "it was this big . . . with tail!") and inspected the adjoining Chinese restaurant to gauge the likelihood of the rats next door making an visit. Gripping live-action true-crime TV, as only you'd find in Germany. Have I mentioned just how much I love the coffee machine in our office lunchroom? This machine isn't some random start-a-new-pot-after-you-finish-the-last-cup beater; it's a WMF Bistro Classic, the pinnacle of German hot-drinks engineering. With the touch of a few buttons, you can be served in seconds with coffee drinks that I've never even heard of. Coffee beans are ground, milk is steamed, water is heated -- and all you have to do is put your cup in the right place and wait. But since I'm a part-time coffee drinker -- an amateur who really only enjoys it when I'm in the right mood -- the reason I really love this machine is because of its hot chocolate attachment. Freshly-made hot chocolate in less than 20 seconds! Of course, like most precision German machinery, all this performance comes at a price -- the only German site that I can find selling the Bistro online gives it a heart-stopping list price of 12,336 Euro (or $15,056.09 at today's exchange rates!) . . . and that's without the hot-chocolate attachment! The coffee machine that's on our floor doesn't make any hot chocolate; it's a lowly WMF Cafemat V without any extras. But for only �10,886, I guess that you can't expect too much. As I trudge downstairs for my cup of cocoa, I can take heart in the fact that the company is saving money -- money that I'm sure we'll find in our quarterly bonuses. It's like 1999 all over again! Social Networking Reaches Its Apex! First there was Ryze, and then there was Friendster and Tribe.net, and then there was LinkedIn, followed by Orkut . . . and tomorrow is sure to bring yet another totally-cool-but-mostly-useless "social networking" site that'll try to eclipse all of them, leveraging the power of communities to blahblahblahblah. Well, now they can all stop trying, because the social networking site for the most important among us has arrived: Dogster. Naturally, Scout has already become a member. This past week, Shelby started feeling a cold coming on, so I put "get cold medicine" on our weekend shopping list. In the United States, this would be a five-minutes-or-less transaction: while you're at the supermarket, stop by the cold-remedies aisle, pick a box from among the multitude offered, and drop it in your cart. At the very worst, you have to stop by the drugstore on your way home from someplace else. In Germany, no way. If you want to buy something with even the slightest amount of medicinal power, you have to purchase it from behind the counter at an Apotheke. The Apotheke (I love the word; it just means "pharmacy", but its older, middle-English-connected origins always make me expect a gnome hunched over a mortar and pestle, lit by torchlight, whenever I go in) is like an American pharmacist where virtually everything has been moved behind the counter. The only things that you can pick up and buy are items that can't harm you in the least -- in this case, artsy soaps, vitamins, a stack of first aid kits. For everything else, you have to get in line -- and on a Saturday, it's a long line. Eventually, I get up to the front of the line, describe my particular problem to the white-coated woman behind the counter -- meine Frau ist erk�ltet -- and she goes off into the back room full of medicine to get what she thinks is best for my needs. After a while, she comes back, gives me a box of pills, and tells me how to use what's inside; then I pay and am out the door. I'm not sure why you have to recite your malady to a stranger, in front of a crowd of strangers, before you can get even the most innocuous drugs -- maybe it's a "safety" thing, so that they can say you recieved proper instruction in how to take the drug. I'm sure that the unions and/or tradition are heavily involved somewhere. I'll have to ask my co-workers. Predictably, the no-drugs-except-at-Apothekes system means that all the "drugstores" have a section packed full of truly goofy 'natural' cures. Got a cold? You need these vitamin tablets -- infused with the power of St. John's Wort and crystals! Shelby's already spilled the beans, but . . . um . . . since we got here, we've been doing a fair amount of our shopping at . . . Wal-Mart. Yes, there are Wal-Mart stores in Germany -- almost a hundred of them, actually. The idea of going into any Wal-Mart always seems a little cringe-worthy to me (and even more so after reading the Los Angeles Times' series of articles on "The Wal-Mart Effect"), but W-M stores are different here -- hearkening back to a kinder, gentler time when American Wal-Mart stores may have been crushing small-town retailers, but were at least still boosting the idea of "Made in the USA". Everything we've bought from a Hamburg Wal-Mart has been made in Europe -- even down to the cheapo nightstand that we bought for Shelby, which was made in Denmark. Plus, W-M employees here are unionized and protected by the same web of laws that surrounds every other toiler in this worker's paradise, so you know that the guy behind the checkstand in Hamburg is doing far better than somebody behind a W-M checkstand anywhere in the United States. Also, W-M is one of the few retailers here that sells food and takes credit cards, something that occasionally comes in handy. One of the few exceptions to the "Made in Europe, More-or-Less" rule is clothes -- and the clothes for sale in Wal-Marts over here are just as cheap and shoddy looking as what you'd find in an American Wal-Mart. But between their general tackiness and the fact that we packed twice as many clothes as we actually need, there's no worry about us expanding the evil reach of globalization that way.